It's great to give something a second lease on life, until it turns out that, being dead, its credit is totally f'd. Transforming found objects into furniture awesomeness, Rustbelt Rebirth. From a trained Ohio welder who says "it wouldn't be uncommon to see me buying wheelchairs from the thrift store on half-price day", RR turns scrap metal and all manner of other discardedness into "unique and often unduplicated" home furnishings that are artistically badass, a phrase that previously only applied to Oz from American Pie -- dude ripped twine and glee club! 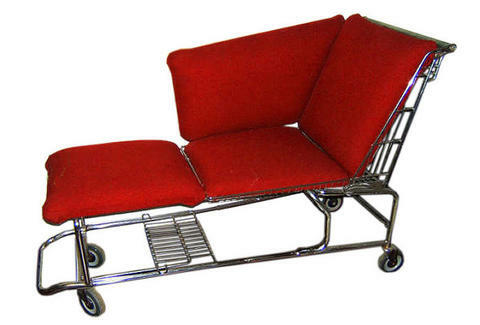 For seating options he's molded a pair of old wheelchairs into a loveseat, and transformed a discarded shopping cart into a padded chaise lounge, which is a great way to make the homeless even less motivated to find jobs. He also has a huge array of storage options, from an entertainment console with cupboards made from old lockers, to a curved stainless steel Micro Bar with a removable drawer, to a similarly styled piece with a round protuberance at the top dubbed the Thumbs Up Bookshelf, appropriate, as the only people who still give thumbs ups are book-reading nerds. He's also more than willing to field unusual custom requests, even entertaining customers who wish to supply their own materials, though given your f'd credit, the only material you've got is hilarious wordplay concerning giving things a second lease on life.